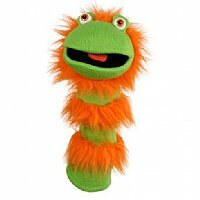 Ginger Sockette Glove Puppet is a whole armful of puppeteering fun! This crazy, 16-inch long (approximately), knit puppet has a green striped body, with alternating orange fluffy tufts, goofy eyeballs and a squeaker in its squeaker tongue - which all adds up to a side-splitting puppet show that will have the audience yelling "encore!" The Sockettes Hand Puppets give kids a wonderful time for imagination and furn. Take Ginger with you the next time you are traveling. Put on a puppet show as you are going down the road and be sure and show the cars that you are passing your fun puppet. Donâ€™t forget to take her into restaurants and have her order your food for you.